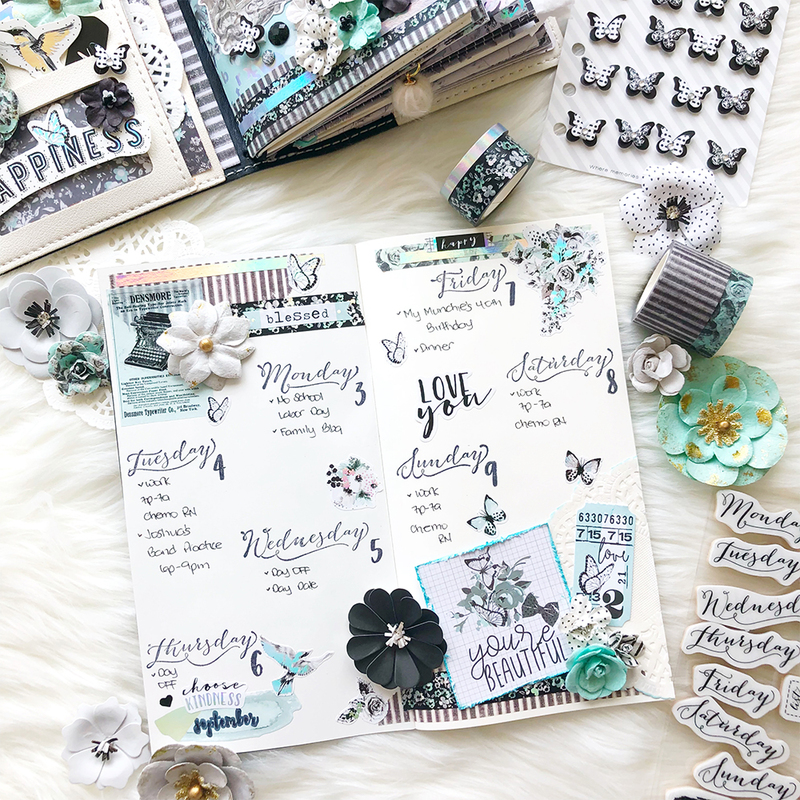 On Friday we had a blog post showing how beautiful Flirty Fluer can be used in Scrapbooking pages and crafty project and today we want to show you how creative Jomelle was in using the Flirty Fluer collection in her Prima Travelers Journal. Prima's traveler's journals have many pockets which make it great for personalizing and decorating with any paper collection elements. 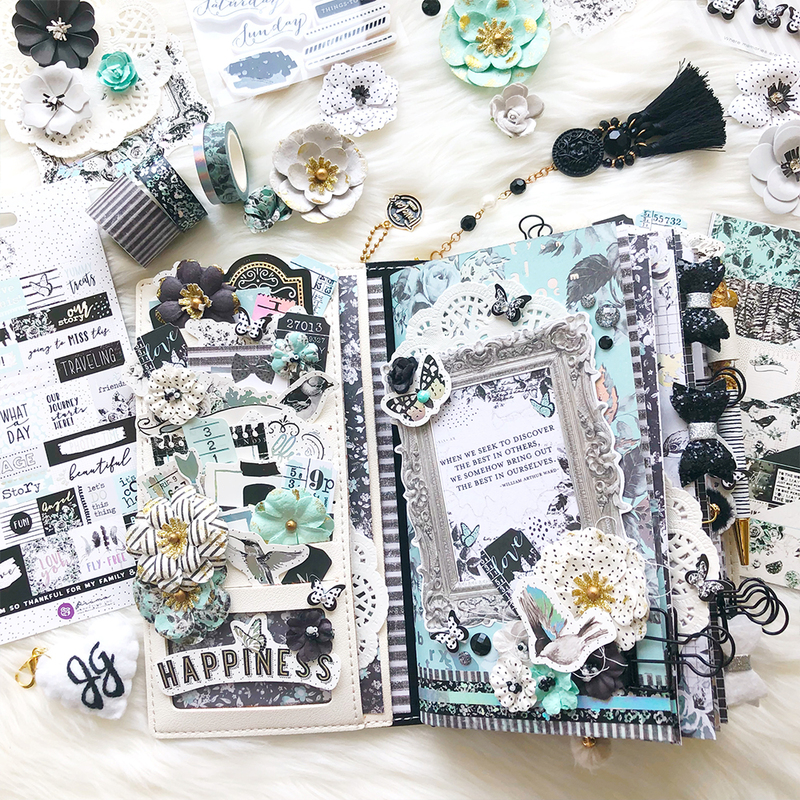 Jomelle used all of the Flirty Fluer paper collection accessories to decorate her pockets in her journal from paper pads, ephemera, tickets, flowers to butterfly stickers and even our crystals. Here you can see how Jomelle covered her notebook with the beautiful paper from the collection and decorated it with doilies and even the frame from the flower packaging. She also used the flowers and crystals along with ephemera to make a 3D look. Flirty Fluer has a washi tape set of 4 rolls. One of the washi tapes has holographic flower accents while the skinny tape is all holographic. Jomelle used these throughout her entire set up from her dashboard to her weekly layout as well. Jomelle used a blank notebook and stamped her days for her weekly layout with the Prima Travelers Journal stamp set and decorated her week layout using the washi tape, stickers and ephemera pieces as well. To see more inspirational projects by olur design team member Jomelle make sure to follow her on Instagram @xoxo_jomelle.